BE EXCELLENT TO EACH OTHER – a how-to flow chart, with discussion. Be Excellent To Each Other: A How-To Flow Chart, by Joy and Peter. This flowchart was actually designed around the same time that Catlander was taking its first steps. As Eric was inventing the Twers Suspension Linkage, I was busy building the philosophy that would take over the company. The purpose of this chart is to help us to think before we speak and then to speak deliberately. If the answer is no, then stop talking. If the answer is yes, go ahead, but speak with love. This calls for you to use your best judgment of the situation you find yourself in. Sometimes hurtful things need to be said, or rather, sometimes painful truths need to be heard. This question reminds us to consider all of our options. So. If the answer is, ultimately, no (it’s not necessary), then stop talking. And if the answer is yes, then Speak with Love. But what does it actually mean to speak with love? Put simply, it means to speak deliberately, choose your words, tone of voice, and body language carefully, with the intent to Improve Good. 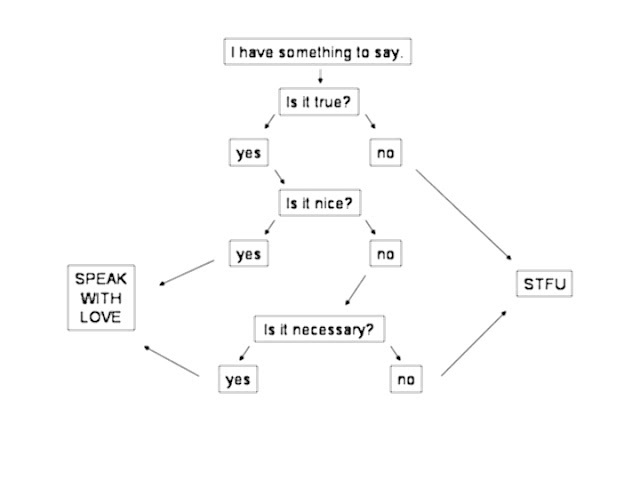 But for a long time, I got stuck thinking that this whole flow chart was just about Speaking With Love to the person in question. Recently, I’ve been seeing that it really needs to be applied to EVERYTHING that comes out of my mouth, regardless of whether the person it might hurt is present. As we’ll discuss in future posts, it’s important to use words carefully. What you request from the universe often comes to be. And what you put out there often comes back to you, in some form or another. Eric and I have been helping each other learn to speak with precision, to articulate exactly what it is that we’re trying to get across, and to consider the many ways in which the words we speak can be heard. Eric told me about a literary device called “innocuous diction” – it’s become kind of a game we play sometimes, when there’s been a hiccup in our communication with each other. What it refers to is the way in which a seemingly straightforward sentence can be misinterpreted in a number of different ways, depending on how you choose to hear it. Eric: Here’s a link about “innocuous diction” http://alibi.com/blog/13592/Darf-MinGehn-In-Kolledj.html as it’s used in Yiddish humor. Innocuous diction requires intonation, emphasis, or inflection to indicate the intended meaning. Statements become ambiguous in the absence of such helpers; a common example of this is in the written word (texts, facebook status updates: we’ve all experienced communication hiccups resulting from using – or reading - unintentionally ambiguous syntax.). Joy: Right. Like the time I texted you, “I have options.” That was a confusion! Here are some examples from our experiences that you can play with. Read the sentences through a couple of times, emphasizing a different word each time. Listen for the different ways in which you’re reading the same words. What can you hear? Share your findings in the comments. - I think I’m funny. - I can’t speak to you about that. You can imagine the problems that could come up were the above sentences to be read with the unintended emphasis – a harmless statement can be heard in a hurtful way. Think of other examples and share them with us. Share your own experiences of communication hiccups due to misinterpreted wording. What I mentioned above about what you put into the world coming back to you is another reason to think before you speak. Eric and I recently had a little epiphany about this, and I’ll share it with you (as a confession): we’ve had this running “joke” about the way girls dress when they go out for a night on the town, specifically around holidays (I think it started at St Patrick’s Day). Eric and I started wishing each other “Happy Whoridays!” when we’d see girls wearing weather-inappropriate bar clothes. This is not Speaking With Love. I don’t think that any of these girls who prompted the “joke” ever heard what we said, but it doesn’t matter. Speaking With Love means to not put that kind of energy out into the world. I could go on here about other passersby who may have heard and been offended by our “joke,” but that, too, is beside the point. Every time I wished Eric “Happy Whoridays,” ERIC heard me. And I heard myself. And that, in no way, Improves the Good in either of our lives. funny – and at what cost. Speaking With Love is as much about hearing yourself as it is about being heard by others. Hurtful words hurt us all, no matter their intended target. Eric and I have decided to abandon this “joke,” now that we’ve thought about it a little more deeply. Learning to Speak With Love almost requires exercising both Absolute Truth (lying is not loving), and Absolute Trust (believing that the other party will hear your Best Possible intent in your words). This isn’t an easy task, simply because not everyone’s on the same page. People don’t seem to know what to make of honesty. We’re sold everything, coerced into so many decisions, told what to believe; it’s hard to just accept anything at face value. But what Eric and I have found is that the effort is so worth it. In future posts, we’ll also talk about Listening With Love. It’s the flip side of examining your own intentions in a conversation, and examining others’ intentions. Hearing With Love is part of approaching life with the Best Possible in mind. I’m learning, through trying to write about it, that speaking with love is connected to ALL of the other Fundamentals. I’m learning that what Eric and I are pursuing here is rooted in NonViolent Communication, which is still a relatively new concept to me. I’ll be reading more about it and sharing what I find here. I set the flow chart as my desktop image so Faron, Jaala, Leisha and I can be reminded of it often. good idea, teri. i have a painting of it on my wall. having the flow chart right in front of me is what inspied this post. I'm impressed! (read that with love) hope you don't mind my popping in on your blog. I'm not too old to benefit from this flow chart and will follow with interest. love ya!